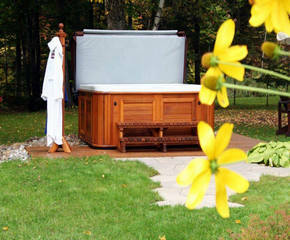 Enjoy spring to the fullest with a new spa or sauna! Get up to $4,000 off Arctic Spas and great deals on saunas now through Saturday, April 20th! It’s a wonderful time to enjoy an Arctic Spa! Spring is a great time to get your patio set up! Get great deals on in-stock fireplaces! Why choose Heat ‘N Sweep? We love the internet, but for big ticket items like patio furniture, hot tubs or fireplaces, the internet just doesn’t cut it. 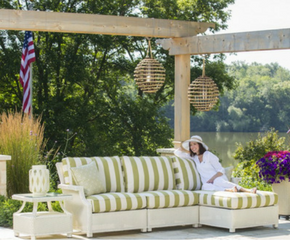 If you’re looking for patio furniture, you know that you’ll be sitting in the highest quality products like the ones we sell for years to come. Nothing can help your decision more than trying out the huge range of sets we have in our fireplace and patio store and deciding for yourself! We also have hundreds of custom fabrics to choose from, so your furniture can be uniquely yours. Hot tubs are products you’ll want to see in the flesh before buying, and we have lots of tubs displayed in our store. We also have one up and running 24/7, so you’ll be able to see and feel exactly what it’s like. You can even bring your bathing suit and take a dip! We also know that revamping, replacing or installing fireplaces and woodstoves is an involved process. Don’t worry, we’ve got you covered. In our fireplace and patio showroom, you can feel the heat of our fireplaces and woodstoves in action. 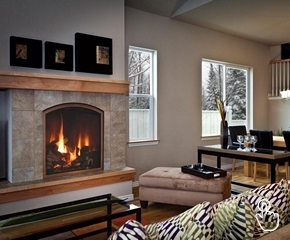 You’ll choose your fireplace or woodstove knowing exactly how it looks and feels. When you come into Heat ‘N Sweep, you can rest assured you’re making the right decision. If you aren’t even sure where to start, don’t worry! We offer design services, so we’ll help you plan a layout and come up with a range of custom options for your hearth, your patio and more. Once you select what’s right for you, we provide stress-free delivery and setup for your purchases, and great warranties and full service installation for fireplaces. Most importantly, we pride ourselves in providing lifelong service for all your purchases. You’ll never have to worry again about finding someone qualified to keep your precious new investment maintained! We know you’ve got lots of projects. But isn’t it a hassle constantly shopping around for someone to help? Consider us your one stop shop for your home, cottage and business. In addition to personal spaces, we love collaborating with restaurants, country clubs, apartment complexes, corporate offices and more. We’ll help you bring to life your vision for any project. Let us be your personal concierge! Don Davis founded Heat 'N Sweep in 1977, after discovering the art of chimney sweeping. The first chimney sweep in Michigan, and the 98th in the United States, Don was honored to provide this much needed service, allowing fellow homeowners to keep their homes safe. Though we don’t sweep chimneys anymore, we still have a passion for fire, continuing to carry top-of-the-line fireplaces and woodstoves. Over the years, we realized there were more ways we could making living better. So our list of passions has grown to include the best in hot tubs, patio furniture, grills, outdoor kitchens, fire tables, saunas and more. Our goal is to truly serve our clients, helping you find YOUR perfect solution. We also deeply care for our employees, prioritizing taking great care of them as well. We also love giving back to our community by supporting and donating to many charities [link] every year. A locally owned company, we actively support other local businesses, helping our local community thrive. We carry a number of products from Michigan manufacturers and throughout North America. If you’re looking for a big-hearted company with quality products, excellent service, and a shopping experience unlike any other, look no further than Heat ‘N Sweep! Visit our furniture store, we're located east of Lansing, in Okemos, MI. Come let us make living better for you today!